Grab the lung and stomach and scrub well, making sure that you scrape off membranes and excess fat, then leave to soak in cold salted water for several hours. Boil heart and liver and let simmer for half an hour. Then, chop heart and grate liver. Toast the oatmeal until golden. Combine all these ingredients and the onions, pepper, cayenne, nutmeg and stock and mix well. Turn stomach inside out and pack the mixture in until the stomach is about two thirds full. Press out the air from the stomach and tie tightly. Place into boiling water and simmer for three hours, adding water to ensure that the stomach is covered. The stomach will begin to swell, when this occurs, prick the stomach several times, to prevent it from bursting. After three hours, undo your tying and you are ready to indulge in haggis. 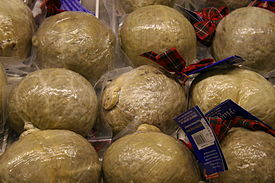 Serve with mashed turnips and potatoes, what we in Scotland call neeps and tatties. Treat yourself to a nip of whiskey with your haggis, it enhances the taste! This entry was posted in Food and Drink on January 11, 2014 by admin_z.